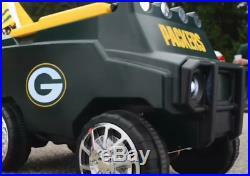 LARGE Pittsburgh Steelers REMOTE CONTROL COOLER w/ Wheels Headlights Speakers 30 Can Capacity. Type: Remote Control Beverage Cooler. Remote Controlled: Drives Forward / Reverse(3 speeds) / Left / Right. Operated on land, grass or sand. Range of Remote Control: Over 100 Feet. 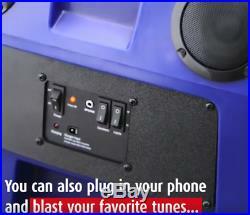 Battery Length: Lasts 4 Hours of Continuous Operation. Holds two cups on top. Dimensions: 32″ x 19″ x 20. 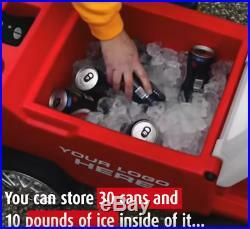 Beverage Capacity: 30 cans and 10 pounds of ice. Maximum Speed: 5 mph. Molded construction provides impact resistance and long life (same construction as the Yeti cups). Manufactured in the US. NOTE: BECAUSE OF SIZE AND SPECIAL ORDER, THIS MIGHT TAKE 2-3 WEEKS TO RECEIVE. 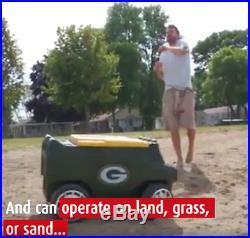 Let the fun begin with your remote control NFL Cooler. 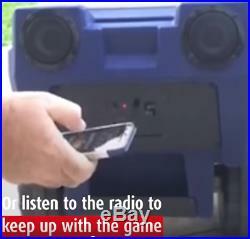 Be the envy of your friends as you deliver cold beverages and listen to music as you hang out. 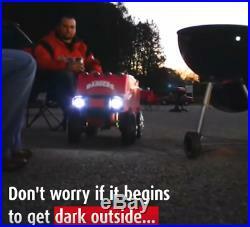 Perfect for tailgating, beach, parties, drive in…… You name it, it’ll be the highlight of everyone’s night! OTHER ITEMS Thanks for looking. Since computer monitors vary in color — the actual color of the item may differ from what’s shown on your computer screen. We are a clearinghouse of major retailers. Special note for INTERNATIONAL buyers. Please take special caution that all electronics electrical items CDs and DVDs are formatted based on the United States Standards and may need an additional adapter to work in the countries outside of the USA. Please be sure to check that these items are compatible for use outside the USA. 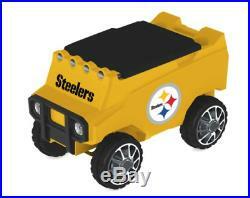 The item “LARGE Pittsburgh Steelers COOLER Remote Control Wheels Headlights Speakers Cans” is in sale since Tuesday, February 06, 2018. This item is in the category “Home & Garden\Yard, Garden & Outdoor Living\Outdoor Cooking & Eating\Ice Chests & Coolers”. 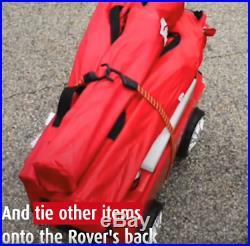 The seller is “lone*wolf628*” and is located in Multiple Locations. This item can be shipped to United States, Canada, United Kingdom, Denmark, Romania, Slovakia, Bulgaria, Czech republic, Finland, Hungary, Latvia, Lithuania, Malta, Estonia, Australia, Greece, Portugal, Cyprus, Slovenia, Japan, Sweden, South Korea, Indonesia, Taiwan, South africa, Thailand, Belgium, France, Hong Kong, Ireland, Netherlands, Poland, Spain, Italy, Germany, Austria, Israel, Mexico, New Zealand, Singapore, Switzerland, Norway, Saudi arabia, Ukraine, United arab emirates, Qatar, Kuwait, Bahrain, Croatia, Malaysia, Brazil, Chile, Colombia, Costa rica, Panama, Trinidad and tobago, Guatemala, Honduras, Jamaica, Philippines.